If you are the caretaker at a school or college, then you’ll know how important it is to have adequate access control within campus buildings. Security is important, not just to ensure student and staff safety, but also so that property and valuable equipment is protected. Traditional key-operated locks offer good levels of security when the keys can be properly managed. However educational buildings have lots of doors, and managing the use of locks and keys on a large scale can often become a complex task. Keys have to be cut and issued to the correct members of staff; lost keys need to be replaced (and so too the locks); doors need unlocking and locking again, all taking time and money to manage. That’s why more and more caretakers and facilities managers are choosing to replace locks and keys with a more convenient and modern method of door entry. A keyless digital door lock is a cost effective and standalone access control product that offers greater functionality over traditional locks and keys. Access through the door is achieved by keying in a code on the keypad. If you don’t have the code, you can’t get through the door. With so many different types of coded locks available on the market, it’s sometimes hard to know which one is best for your application. Digital locks are either mechanical or electronic in operation. A basic mechanical push-button door lock can cost anything upwards of £30 whereas a top of the range electronic lock can cost several hundred pounds. 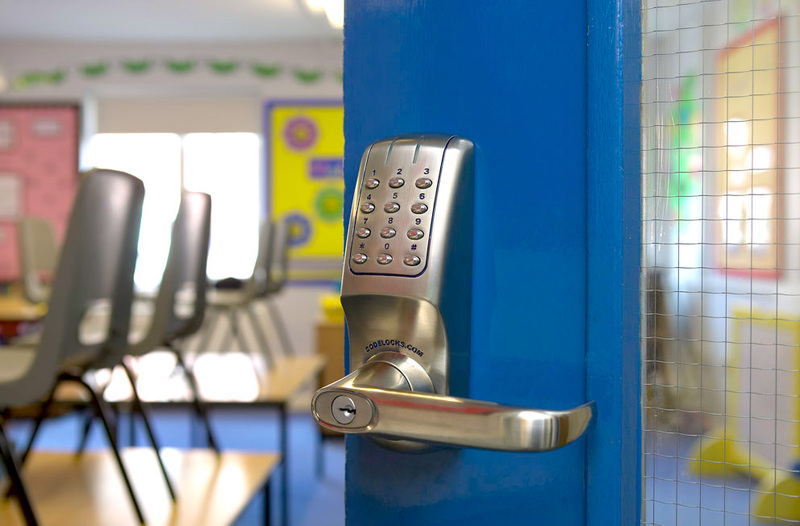 If you are looking to modernise access control at your school or college, we’ve put together a checklist of questions for you to consider before you make your investment. How often will the locks be used? This will depend on the location of the door in the building. For example the staff room door is likely to be accessed much more often than a door on a store cupboard. Rooms used on a regular basis will require more robust door locks than those used only occasionally. What are the doors made of? Wood, aluminium or glass? You’ll need locks suitable for the material of the doors. Do you need keypad access on both sides? This is called a ‘back-to-back’ facility and it’s useful when you want to restrict access both in and out of doors. Do you need a ‘hold open’ facility? This feature is particularly useful for classroom doors as it allows the lock to remain open for free access during the day, but will restrict access out of hours. How often will you need to change the code? To maintain security, we recommend that you change access codes on a regular basis especially as pupils and students are likely to pass on the codes. It’s much easier to re-code electronic digital locks, as you don’t have to remove them from the doors to change the access code. Do you want the doors to lock automatically when shut? If so, then you’ll need digital locks with a spring-loaded mortice latch. Do you require access with a key? This is known as a combination lock where you can unlock the doors using the access code on the keypad or by using the key override feature. This feature is useful if you employ lots of maintenance staff and cleaners that need to be able to access every digital door lock in the building with a single key, without having to remember all the different codes. Do you need the locks to be tamper proof? Tamper time out is a feature on electronic digital door locks that can help prevent pupils and students trying to guess the access code. The lock will shut down after three incorrect attempts, which will help frustrate opportunists in the hope of getting lucky! There are many areas within a school or college campus that can be given access protection. As well as classroom doors you may want to consider the science labs, sports hall, gym, changing rooms, IT and server rooms, head teacher’s office, administration office, storage cupboards, medical rooms, outdoor sheds and access to the kitchen or canteen. For more details on our full range of keyless entry door locks visit our website or call our technical support team on 0800 393405 who will be more than happy to talk to you about your requirements. Hello, I would like to receive more information about your locking system for school. I would like to receive pricing list of the different locking system. The school address is Adrain R3 School Dist 601 NE. Houston St, Adrian Mo 64720, Phone Number 1-816-297-4460 ext 1911. Thank you! Thanks for leaving a comment. All the prices are on our website, please visit http://www.codelocks.us/ for more information.